There has been an awakening…have you felt it? Meet the KYLO REN sneaker, the latest footwear in Po-Zu’s co-branded Star Wars footwear collection. Step on over to the dark side with the new KYLO REN high tops by Po-Zu. He’s the leader of the fearsome Knights of Ren and now you can walk in his shoes. These incredible high-top vegan lace-up sneakers have been manufactured using organic cotton. The entire sole, including foxing and toe cap is made in locally sourced Fair Trade rubber sole, certified by the Fair Rubber Association. Featuring removable memory-foam Foot-Mattress™ (allows orthotics placement) in latex and coconut husk. 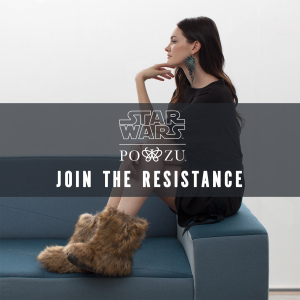 ‘Star Wars™/Po-Zu’ woven label on tongue. Wow. Once again Po-Zu have outdone themselves with this incredible new range. To own a set of Kylo Ren sneakers is every fanboy’s dream…and that dream is about to be realised in stunning fashion, and for the low price of just £69.00 they are a steal. Every Star Wars fan deserves to walk in the shoes of the sinister leader of the First Order, and these incredible sneakers will make for the perfect Fathers Day present! Available in sizes EU 36 (US 5, UK 3) to EU 47 (US 13.5, UK 12.5) for immediate dispatch.